Along with today’s announcement of the Galaxy Tab 2, Sprint also announced two additional devices that customers will be able to purchase this Fall. The LG Optimus G and LG Mach both run on Sprint’s 4G LTE network and feature some pretty decent specs, the Optimus G’s which we are already quite familiar with. It houses Qualcomm’s Snapdragon S4 Pro chip, a massive 13MP camera, and features a 4.7-inch WXGA True HD IPS Plus display. As for the Mach, it’s a mid-range slider device that runs Ice Cream Sandwich, features a full-QWERTY keyboard, and runs off a 1.2GHz dual-core processor. No exact date besides “this Fall” has been given and the same goes for pricing. To read the full presser, check below. SAN DIEGO (BUSINESS WIRE), October 09, 2012 – As part of Sprint’s (NYSE:S) commitment to bring customers the best 4G LTE experience combined with the value of Truly UnlimitedSM data on smartphones, four new devices will soon be added to Sprint’s already impressive 4G LTE lineup: Samsung Galaxy Tab® 2 10.1, LG Optimus G™, LG Mach™ and Sprint Plug-in-Connect Tri-mode USB. Pricing and availability for each device will be shared at a later date. Samsung Galaxy Tab 2 10.1 is the first tablet to combine the benefits of Sprint 3G and 4G LTE with a vivid 10.1-inch touchscreen display, Android 4.0, Ice Cream Sandwich and a 1.5GHz dual-core processor. LG Optimus G features an advanced 13-megapixel rear-facing camera, making it a dream device for photo lovers who are ready to leave their point-and-shoot at home and just carry their smartphone. LG Mach makes 4G LTE accessible as an inexpensive yet sleek smartphone with a full QWERTY keyboard and Sprint ID. Sprint Plug-in-Connect Tri-Mode USB brings Sprint 3G/4G/4G LTE directly to a laptop through a USB connection. Samsung Galaxy Tab 2 10.1 brings to life the data capabilities of the Sprint 4G LTE Network on a large beautiful display making it the ideal device to watch a video, listen to music, check email or surf the Web. The new tablet offers endless content access in a sleek design that maximizes the home entertainment experience. Using the built-in IR Blaster, Galaxy Tab 2 10.1 can be used as a universal smart remote that helps users easily find their favorite TV shows. Galaxy Tab 2 10.1 boasts two cameras, a rear-facing 3-megapixel camera with LED flash and video capture for taking pictures of life’s important moments as they happen and a front-facing VGA camera for Face Unlock and video chat. Additionally, on-device encryption and VPN access ensure the tablet is secure for business use. The 7,000 mAh battery keeps the devices connected throughout the day, and the 3G/4G LTE mobile hotspot capability supporting up to 10 Wi-Fi enabled devices simultaneously. 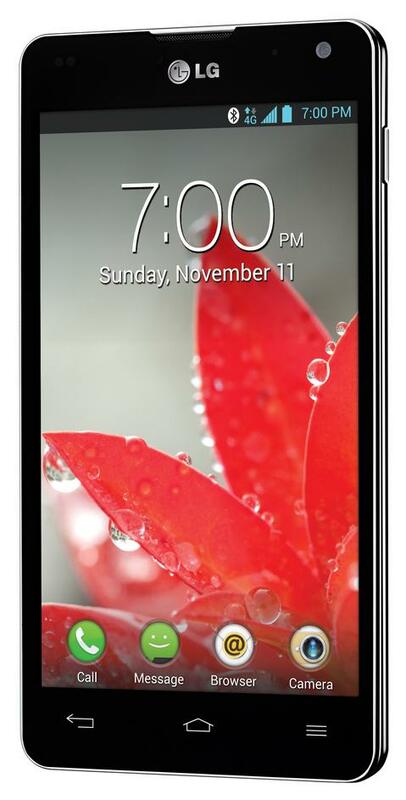 LG Optimus G, the latest superphone from LG Electronics, combines the Sprint 4G LTE Network with the power of Qualcomm’s Snapdragon™ S4 Pro CPU quad-core processor to create an extremely fast and incredible mobile experience. Equipped with a high-density 2,100 mAh battery and impressive 4.7-inch True HD (high-definition) IPS Plus display, LG Optimus G users can seamlessly multitask between personal, business and entertainment needs and go beyond the boundaries of traditional on-the-go smartphone capabilities. Beyond the advanced 13-megapixel rear-facing camera, LG Optimus G has unique camera capabilities including Time Catch Shot, which empowers users to choose the best photo among various shots taken before the shutter button is pressed, and “cheese shutter,” which allows users to take a photo by just saying the word “cheese.” Additional features include 32 GB of internal memory, a 4.7-inch WXGA True HD IPS Plus Display (1280 x 768) and the Android 4.0, Ice Cream Sandwich operating system. An ideal entry point into 4G LTE, LG Mach will be one of the thinnest devices with a QWERTY keyboard offered by Sprint. Additionally, its 5-megapixel camera with LED flash allows users to capture images in a snap, and the front-facing camera makes video conferencing a breeze. Full 1080p HD recording and playback allows users to watch streaming movies on the go, or show off those videos to friends and family. Featuring Sprint ID, LG Mach allows users to cut through the clutter of more than 600,000 apps in the Google Play store by selecting from a variety of mobile ID packs featuring apps, ringers, wallpapers, widgets and more. Sprint ID packs currently include Green, Fashion and Beauty, E!, MTV Music, CMT and NASCAR Sprint Cup. Sprint expands its 4G mobile broadband portfolio with the addition of the first tri-mode USB device, Sprint Plug-in-Connect Tri-Mode USB. It provides an easy-to-use mobile broadband solution for instant connectivity and enhanced productivity while on-the-go. With no software to install or startup delay, the Plug-in-Connect Tri-mode USB works just like an Ethernet cable – just plug in and go. For business customers, the device gives the flexibility that mobile workers need with real-time access to company resources, networks and data. Additional features include a fold-away USB connector, LED service status indicator and hands-free activation. All smartphones, including LG Optimus G and LG Mach, require activation on one of the Sprint Everything Data plans starting at just $79.99 per month (taxes and fees excluded) with Truly Unlimited data, text and calling to any mobile. No throttling, no metering and no overages, all while on the Sprint network. With Sprint’s Everything Data and other plans that include Truly Unlimited data, Sprint is continuing its history of data leadership by making it easy for its customers to use data in all the ways that are useful to them, such as news, email, music, TV and GPS navigation, without worrying about data overages on their monthly bill. Sprint 4G LTE is available in 24 cities[i] and is expected to be in more than 100 additional cities in coming months. Sprint introduced its all-new 4G LTE network in July 2012 and expects to have largely completed the nationwide build-out by the end of 2013. For the most up-to-date details on Sprint’s 4G LTE portfolio and rollout, visit www.sprint.com/4GLTE.